PanARMENIAN.Net - Italy’s Chamber of Deputies hosted a conference on the Armenian Genocide on Tuesday, April 16. Armenia’s ambassador to Italy Viktoria Baghdasaryan delivered opening remarks thanking the lower house of parliament for supporting the recognition of the Armenian Genocide on April 10. The ambassador said the process of the international recognition and condemnation of the Genocide is under way and that denialist policies in no way fit into the 21st century value system. 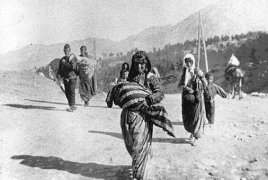 With the resolution of April 10, Baghdasaryan said, the Italian side reaffirmed its commitments under the UN Convention for the Prevention and Punishment of the Crime of Genocide. Representatives of Italian political, scientific, cultural circles too spoke at the event to stress the importance of the decision on recognition of the Armenian Genocide.